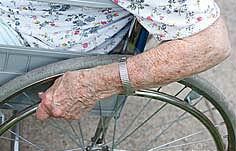 Ensure clients living at home are being supported, and contracted services are performed well. 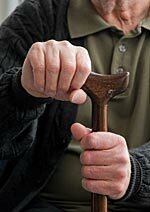 Act as liaison between the elderly or disabled and their out-of-town relatives. Advocate for clients with physicians, insurance, hospital, nursing homes, and retirement communities. Following are several examples of the nurturing support Sanders & Warren care managers provides to those without nearby family. Mr. B was a single, 80 year old male living alone. The trust officer at his bank noticed he was exhibiting signs of frailty and called a geriatric care manager at Sanders & Warrens for an assessment and recommendations. The care manager counseled with Mr. B and coordinated services that kept Mr. B functioning. Together Mr. B and the care manager looked at housing options. Once Mr. B decided on new housing, the care manager helped him with the move and the sale of his home. After the move the care manager continued to monitor him. When Mr. B was hospitalized, the care manager arranged for 24/7 help at the retirement facility upon his return, and monitored medical issues and emergencies as they arose. Ultimately, the care manager arranged for hospice. Following the client’s death, the care manager worked with the trust officer to make funeral and burial arrangements. Mrs. M is a 85 year old widow living in a retirement community. Her closest relative is her niece who lives in Florida and who is her power of attorney for healthcare. Recently, Mrs. M had a red and swollen area on her leg. The facility feared a possible blood clot or cellulitis. Mrs. M refused an ambulance but the residence director felt she needed immediate attention. A staff member took Mrs. M to Urgent Care and stayed there with her until she was treated and released. Since it is not within the responsiblility of the facility to accompany patients to outside emergency medical visits, the director gently suggested to Mrs. M that she needed to have a local support person to respond to emergencies and help her in the ways a nearby family would. Mrs. M was willing to meet with a care manager from Sanders & Warren. While Mrs. M did not wish to replace her niece as Power of Attorney, she wanted to have a care manager listed as successor POA who could act on her behalf until her niece could be reached and/or could get a flight from Florida. The niece welcomed the support in caring for her aunt. It was agreed that a care manager would visit monthly and observe for health changes and would be available in emergencies and for any needs that Mrs. M might have that were beyond the scope of the residence staff. Mary Lou, daughter of Mrs. C, called Sanders & Warren to request advice and assistance. The skilled care facility where her mother resides wanted to move her mother from the memory care unit to a skilled care medical floor. Mrs. C had been there for five years and the family had taken great care in decorating her room and had even planted a tree outside her window and hung a bird feeder. Mary Lou said the facility planned to move her mother because she was now wheelchair bound and required more assistance with activities of daily living. The facility also needed the room for new ambulatory wandering dementia residents. Mary Lou felt the staff was not listening to her concerns or taking her mother’s needs into account. A care manager visited and observed Mrs. C throughout the day. She also took note of the conditions and needs of the other residents on the memory care unit. Nine other residents on the floor were wheelchair bound. Although Mrs. C needed some assistance with eating, the other residents needed more assistance and were very difficult to feed. Mrs. C had a good appetite and opened her mouth readily and could hold her own cup. Most importantly she was one of the most active participants in the memory care activities, eagerly answering trivia questions or singing along. Our care manager also visited the skilled medical floor to see what services and activities would be offered to Mrs. C. She found most of the scheduled activities required greater concentration and hand dexterity than Mrs. C possessed. Also, many residents spent time in their rooms watching television and Mrs. C could no longer follow the plot of most TV shows. The care manager attended the care conference along with Mary Lou and successfully made the case that Mrs. C was benefitting more from the specialized memory care activities than most residents and that several others required more care than she did. Mrs. C. was permitted to stay in her room on the memory care unit where she is happy and her needs are being met. Mrs. R is widowed, has no children, and her siblings are deceased. 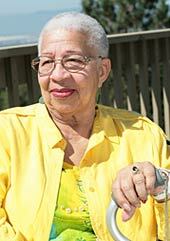 She has macular degeneration, severe osteoporosis, and uses a walker. Because Mrs. R has difficulty writing, her care manager writes all of Mrs. R’s checks for her to sign. All copies of her bank statements and quarterly accounts are sent to her attorney for review. Mrs. R remains close with one nephew who lives in a nursing home in southern Illinois. Her care manager arranged for Mrs. R to be transported to visit the nephew and have a photo taken during the visit. This picture sits on Mrs. R’s bedside dresser. In review of her insurance, the care manager found that Mrs. R had prescription drug coverage and notified the pharmacy. Monthly drug costs were significantly reduced, eliminating the need for withdrawals from savings to cover her prescriptions. This preserves Mrs. R’s financial resources, insuring that she can afford to live in her retirement community for many years to come.